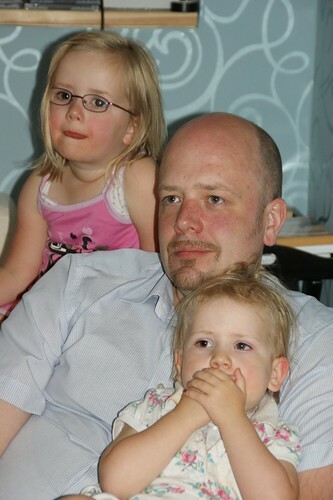 Thomas, Anna and Amaia, a photo by PhylB on Flickr. Amaia is more of an introvert than Anna. It isn't immediately obvious when she's surrounded by her family because she's the baby of the family so often plays cute and clowns about. When I take Anna into a stranger's house she often acts quite grown up - she asks questions, and she tries to engage them in conversation. Amaia used to be quiet but in the last month she's started covering her mouth whenever she's ill at ease or afraid. She doesn't do it momentarily though, she leaves her hands there until she's happy again! I was recently invited to a Breast Cancer fund raiser at a friend's house. When I walked in she had approximately thirty friends in her kitchen eating cup cakes. Amaia was with me. She didn't cry or ask to be picked up, she simply clasped her mouth and remained motionless for the whole hour I was there. I had to laugh when one woman actually asked me 'Excuse me, is your baby going to be sick?'! I think I am going to have to work on her showing her introvert streak in a slightly less embarrassing manner! I had this great rucksack for a decade or so when I was younger. I think I got it at about 18 or 19 to go back-packing round Europe and it didn't die until BA accidentally sent it from Frankfurt to Osaka when I was 30... the problem was Marcel and I were going to Heathrow, so when my rucksack made it back from its world tour full of nappies and baby food, it was in several pieces. I took that as a sign I was finally meant to grow up and buy a boring suitcase! They did offer to pay for a replacement but it was irreplaceable. 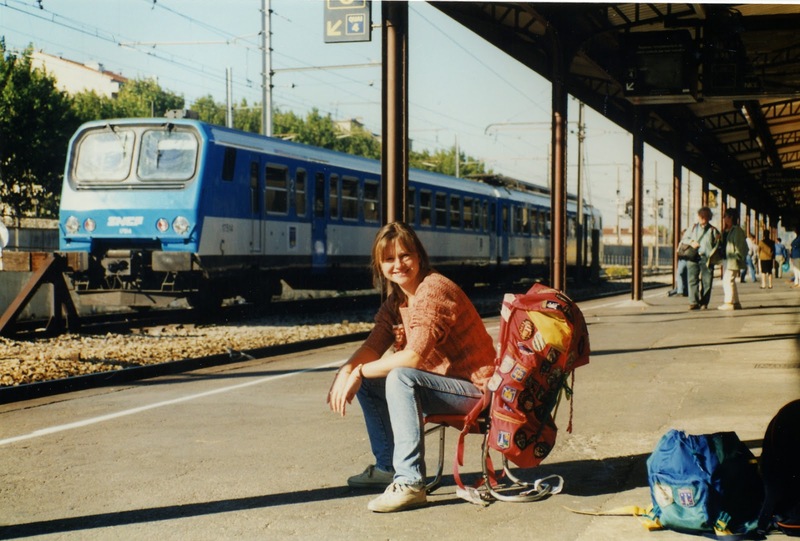 It had been everywhere with me and as you can see - it turned into a chair so you could always hang about comfortably between trains, even when the waiting time was hours. When trains turned out to be too full I always had a seat. I often took the Strasbourg-Marseilles train on a Sunday when I lived it France and was asked by countless strange young men if I would allow them to take a photo of me on my rucksack. At first I took it as a compliment, till one night a guy actually asked if I'd mind getting off it so he could see it better on his photo! I wasn't half as interesting as my trusty luggage! Anyway, looking through some old photos last night brought it all back - those were such special times. I can't help think Ryanair with their specified case size have killed off quirky things like my old bag! I don't think today's students will have the same to look back on! How can you tell when someone's been in your bed while you were out shopping? Do I have psychic powers, or is it maybe the chocolate hand prints? Kissy bear, a photo by PhylB on Flickr. One by one we've been dropping like flies the last few days with a vomiting bug. Last night was Anna's turn. She vomited all over Léon's Kissy bear (my 36 year old teddy) during the night. 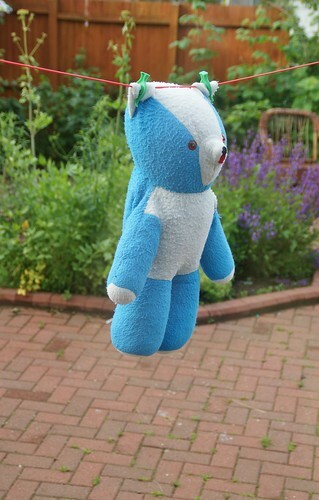 The bear was stuck in the wash (and surprisingly didn't disintegrate!) and she came down to our bed for the rest of night vomiting on and off all night. Finally after about twelve hours she came through, stopped throwing up and started to feel a little hungry. Quite matter of fact, and with no emotion other than a little surprise, she stated 'I think I am starting to get better.' I didn't think about what she was saying until she added. 'I thought I was going to die. When Pumpa got sick he died.' When I think about it, she got a 100% attendance certificate at nursery last week so she probably doesn't remember the last time she was sick. Wee pet. 'J' has been round for another coffee - or rather glass of wine with mother. After her last story, I had to share this with you! J's husband's parents are buried in a little cemetery in a village somewhere in England. J and her husband don't visit it very often. After a break of ten years they went to visit. They found the headstone was somewhat grubby and in need of a little tlc. J's husband knew a local undertaker so went round to offer him the job of taking care of it. He tried to explain where plot was. The undertaker wasn't 100% sure where he meant so asked him to show him. They jumped into his hearse together to drive across town to the graveyard. There wasn't a seat for J so the undertaker suggested to J that she sit in the back as it was a quick trip. J has a wicked sense of humour. J thought it'd be fun to lie in the back of the hearse as if she was simply missing her coffin! That was disconcerting enough for passing cars, she said, but to cap it all she thought it might be fun at traffic lights to sit up slowly and wave to passers-by! I guess you can choose to be dignified in your older years, or on the other hand, choose to have the time of your life! I think I'm going to have her round for coffee once a week! 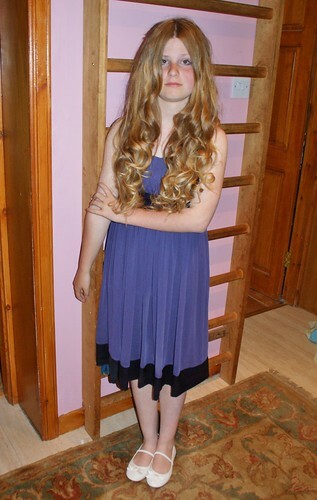 Last day of primary, a photo by PhylB on Flickr. It's a sweet custom. I don't know when it started but they didn't do it in my day! I'd have been hung out to dry if I'd come home from school in that state! 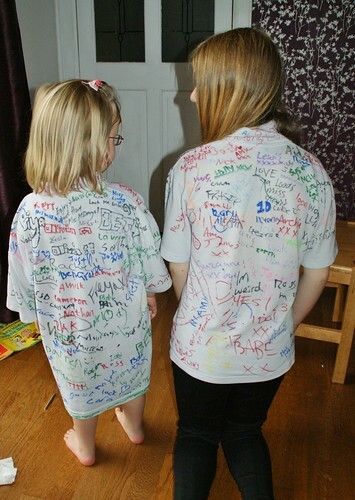 But nowadays the last day of primary school is spent having the kids and teachers in your school sign your t-shirt, then proudly walking through town in it (even in the rain!) Lots decided to have two signed and given Anna left nursery yesterday, she got to wear the other one to signify she too was moving onwards and upwards. Anna was particularly thrilled to be asked to sign Lots's t-shirt too - it definitely made her feel quite grown-up. They were as thick as thieves today, the two of them. It is hard though to watch them both move onto the next stage of their lives without their beloved Pumpa there to see them. I so hoped he'd hang on long enough to see Lots's dance last week. It would have given him an insight into the woman she will one day become. Life will be filled with these bitter-sweet moments from now on. If my children ask me for advice when they are older, things I would have ideally done differently, I think I would advise them to have their children younger than I did. Obviously, I couldn't have had Anna and Amaia any earlier because I had them within a couple of years of getting together with Thomas, but Marcel was born after André and I had been together 12 years, Charlotte, nearly 15. Time speeds up with age, as we all find out too late. I feel Marcel's primary years just about took a reasonable amount of time, but Lots's seem to have passed by in a flash. Didn't I take this photo (left) yesterday? 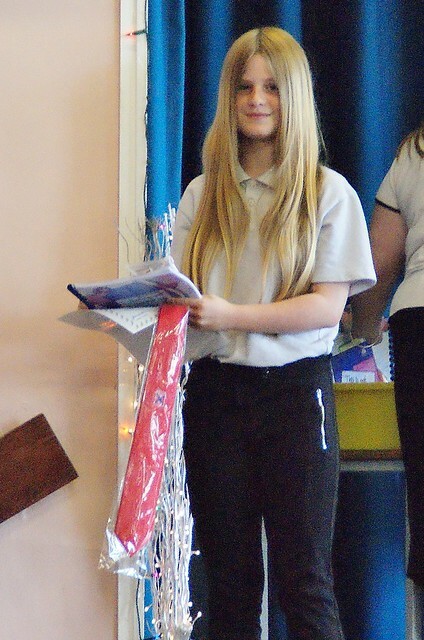 And yet here we are graduating from Kirkhill already. I was recently discussing this with Marcel - saying I wished I'd had my kids earlier. He asked 'Why, is it a bit tiring dealing with small kids and sleepless nights at 44?' Not at all, I'd do it again in a second but at 44, with a baby you are painfully aware of your own life-expectancy, of the chances you have of seeing your grandchildren grow up and that hurts in a way I could never have imagined in my early twenties. 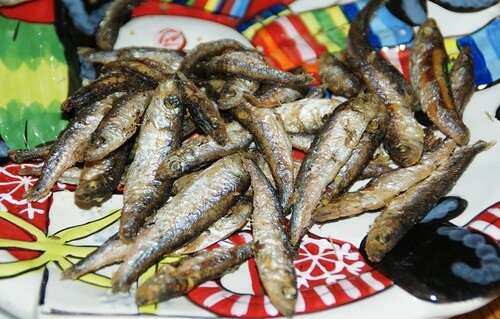 Whitebait, a photo by PhylB on Flickr. I used to get whitebait a lot in the south of France, but I'd never seen it in Scotland till Saturday when I happened to be in Makro bulk-buying loo roll as you have to in this big a household - you know 64 for the price of 48! Anyway, a bag containing four adult-sized portions was only £1.75! And the whole thing took three minutes to cook! That made me a happy bunny! Every so often you come across an idea so simple you wonder why it hasn't been done before, so genius you wish you'd had it first. I came across it in Tesco at the weekend. When you have four school-age kids all wearing grey socks as part of their uniform but in (UK) sizes small 9, small 12.5, adult 3 and adult 9, you become absolutely demented after a wash trying to pair socks and then work out whose are whose. I had even taken to only washing one child's clothes at a time as the only way of getting round this issue. Tesco - I love you! Tesco has started printing the size of its school socks on the inside of the elastic at the tops of the socks. Genius! I take my hat off to them! Praise the restoration of my sanity! I'd quite like a Fiat Scudo. Unlike most people carriers with their 2-3-2 set-up, Scudos come in a 2-3-3 format, despite not being physically much bigger. We used one in Paris at Easter and it was just perfect for a family like ours. Strangely though, they don't seem to be on sale in the UK. You can buy a Scudo van easily but not a Scudo people carrier. How frustrating! I have to say, J's view of the world always brings a smile to my face! I have to admit to having a wee problem with scotch bonnets. 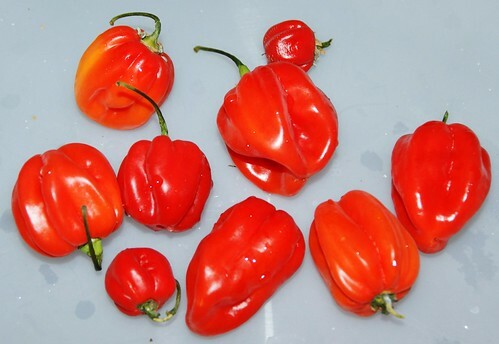 You see they are just so much more attractive that Asda or Tesco mixed medium strength chilis that whenever they have them I buy them and of course, once they are in my fridge, I can't stop myself from tossing one, two or more into my dinner. They just don't look that much more fierce than the normal ones! They are so shiny and I love their shapes. I have had to bulk-buy coconut milk and cream to calm down dinners I accidentally, out of love for their beauty, over-chili. I feel sorry for my poor babies! 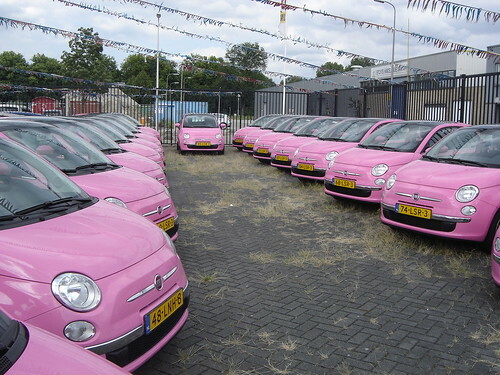 Utrecht: Pink Fiats 500, a photo by harry_nl on Flickr. I was talking to a friend today about my ideal car. I was sure I had blogged it before, but it turns out I haven't! How cute is this wonderful photo I found on Flickr?! on my car, a photo by PhylB on Flickr. Whenever I've been looking for a used car, whether that is on Arnold Clark, Machargs or Evans Halshaw's websites, I am left puzzled as to why they don't cater for larger families. When you have one or two kids, you can choose any car you fancy, so you often want to put in a specific make or model that takes your fancy. When you have five kids, you want to see what they have with seven seats or more. I can fill in make, model, age, transmission, fuel type, number of doors, mileage, colour etc but I can't specify the number of seats, so I have to google makes and models to find out what has seven seats then look at each make separately. It must be a no-brainer to add a box where you simply tick six seats, seven seats etc. Lots's new favourite hat!, a photo by PhylB on Flickr. Mum was throwing out some of her old clothes last week when she came across an old hat she'd bought in Turkey in the 90s. It was rather colourful to say the least and a rather odd shape too. I thought the little ones might like to use it when they were dressing up so put it in their clothes box. Today Charlotte was helping Amaia put on a tutu when she came across it. She couldn't believe I hadn't given her first refusal. She took it and kept it on all day. 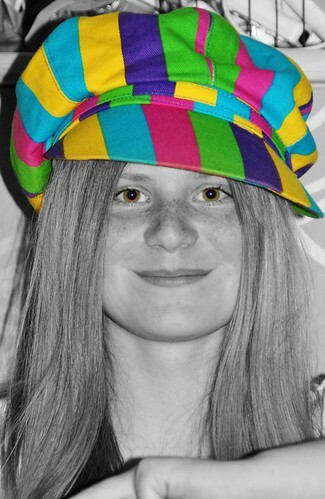 She then asked me to take photos of her in it and finally suggested I colorize them as it was just perfect for that. When bedtime finally came, she left saying she intended to sleep in it. Charlotte can be painfully shy at times, not brave enough to stand out from the crowd in any way but just when you are least expecting it she goes to the other extreme. She is such a complex individual. DSC_0120, a photo by derek1971 on Flickr. I love this photo my brother took of my beautiful baby earlier this month. It really captures what a soft, gentle little soul she is. It also shows her fluffy, wispy baby hair and her lovely green/hazel eyes. She's my special little girl. DSC_0159, a photo by derek1971 on Flickr. 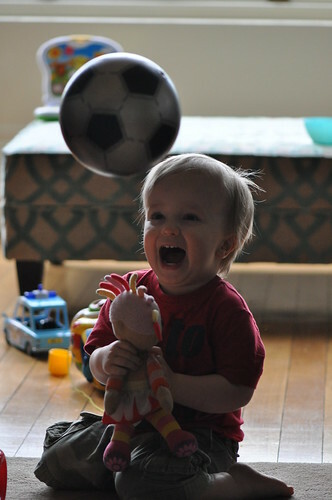 I tried over and over the other week to get a good photo of my nephew heading a ball. My brother must have thrown it at him fifty times before we actually got a decent shot! But he enjoyed the fun anyway. I was discussing 70s wallpaper today with my niece in France. 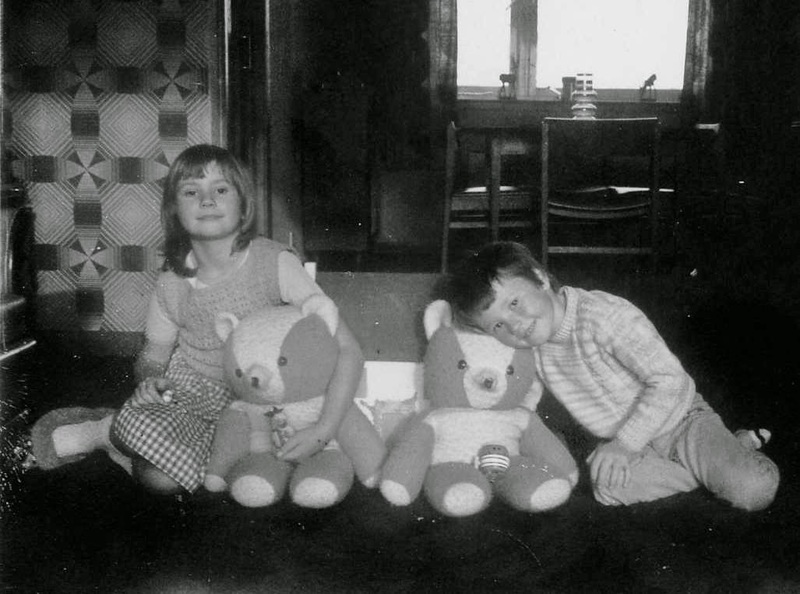 I remembered some of the horrors we'd had in my home as a childhood so went looking for a picture. Unfortunately, it being the 70s, all my photos were in black and white. I uploaded it anyway to show her the pattern. Anna and Léon noticed it on facebook and it caused amusing questions from both... First came Anna's take on it 'Mummy, didn't they have coloured-in photos when you were little?' I thought this was an awfully sweet way to describe the concept of colour photography. Léon was a bit deeper... 'Mummy the bear in that photo is blue nowadays, I know because it is mine. So when this photo was taken was it still blue or was it grey back then? In fact was colour added to the world after these photos were taken or did it just not show up on photos back then but the world was actually colourful, even when you were wee?' Good questions, though I have to say they make me feel somewhat old! 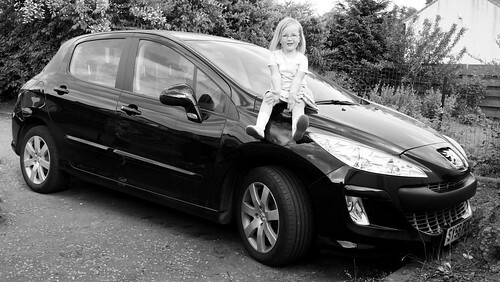 Anna on the Peugeot, a photo by PhylB on Flickr. After a month of financial juggling and the selling of Thomas's car, we finally got together enough to buy dad's car yesterday. 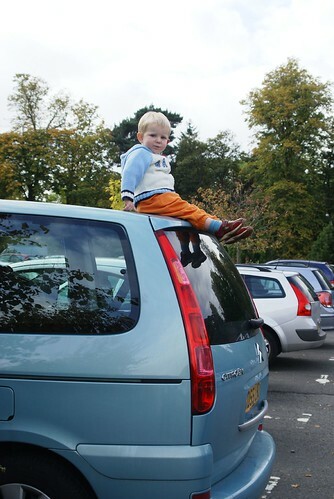 The big kids marvelled at the leg room - at nearly 1m80, Marcel hasn't been the greatest fan of the Nissan Micra's back seat of late... The sound system is so good, I'm trying to work out where I can go unnecessarily, just because it is so much better than my ipod dock in the house. Léon was happy to show it off too at school this morning. But Anna summed it up for all of us on the way home from nursery - I wish we still had the red car and our Pumpa, rather than a lovely new car and no Pumpa. In the bath, a photo by PhylB on Flickr. I love to capture language around this age, as they try to explain the world around them using their limited vocabulary but vast imagination. I have to share tonight's classic with you. In the bath this evening Amaia farted. 'Wow Mummy, bum bubbles!' she announced proudly! I imagine farts will henceforth be known as bum bubbles in this house! So there I was pottering around the kitchen when the theme from Harry Potter began to play on my mobile. I came back to my computer. Five minutes later an email message popped up in my inbox from 'Fred' at ebay customer support! 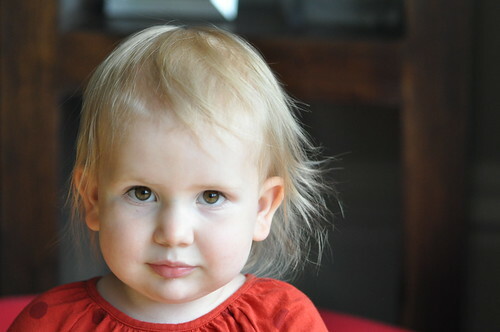 I was taking photos of Amaia the other day when she suddenly started posing and acting cute. 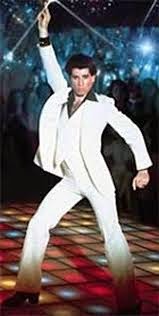 I couldn't help but remember the old John Travola Saturday Night Fever Poster when she struck this pose! I think dad would have liked this. Dad and Anna, a photo by PhylB on Flickr. I've spent the last few days helping mum bag up dad's clothes and bringing them here to show Thomas and Marcel before packing them off. I've just walked into the living room in time to see Anna hugging a black bin bag with her head almost inside casually announcing - This smells lovely mummy - it's all Pumpa-y! I see Ray Bradbury has died at the age of 91. I have had a curious love-hate relationship with Ray Bradbury since 3rd year at high school. I was a late starter really in English - never really enjoying the subject until high school. I was just coming around to it in 3rd year, despite a rather fierce 6 foot tall English teacher who frightened me half to death. She was the much-feared Mrs Findlay, I can still hear her today yelling at us "That's Findlay with a 'D'!" As if we'd ever forget! She was a great hater of nail varnish and I remember the girls, and sometimes even the boys daring each other to come in wearing paler shades in an attempt to get through a whole 40 minute period without being dragged physically into her cupboard to have it removed with the nail varnish remover she kept in there! Anyway, enough about Mrs Findlay's hatred of nail varnish, and back to Ray Bradbury... We had been asked to write a short essay on a subject of our choice. I wrote mine, re-wrote it and was feeling very pleased with myself. I thought I had finally got the hang of essay-writing. I handed it in and waited smugly for a nice fat 'A' on the paper when it was returned. A week later she threw it at me and spat 'I've given this a zero because I refuse to mark plagiarized work!' I hadn't the foggiest idea what she was talking about. I wanted to cry. What have I plagiarized? I asked. This is almost a verbatim copy of Ray Bradbury's Pedestrian and well you know it girl! she accused. I had never heard of Ray Bradbury! I had never read the Pedestrian and I felt aggrieved that she was accusing me. I felt it was somehow Ray Bradbury's fault for stealing my idea and causing me public humiliation and I couldn't quite work out who I hated more - Ray Bradbury or Mrs Findlay! Anyway, I should probably finally give up the grudge and allow myself to read The Pedestrian at long last! In a fairly carefree manner she folded many of his shirts and t-shirts and put them into black bags as mum held them open. (I had no idea my dad had more clothes than you can buy in Silverburn :-\) Meanwhile, downstairs, Marcel had put all of his shoes in pairs across the hall floor. He was the only one tall enough to reach the shelf he kept his shoes on. I knew dad was a shoe lover so was less surprised to find more than twenty pairs up there. Anna, again, didn't seem overly worried. But as we got into the car to leave, she had a complete meltdown, sobbing hysterically all the way home. When I had finally hugged her calm again, she explained: Pumpa loved shoes. He told me he loved my red shoes when I got them at Xmas. I got new sandals last week and if he was alive he'd probably love them too but he died and now he can't see my sandals or tell me how beautiful they are. And there's no way he'll ever come back to life to see my sandals and that's not fair because he'd like my sandals! 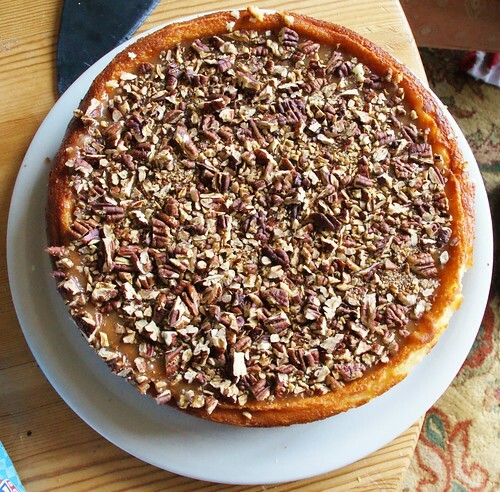 Caramel pecan cheesecake, a photo by PhylB on Flickr. How is a girl ever meant to lose any weight when living with a guy whose ambition is to make the perfect cheesecake, and who keeps experimenting and deciding it just isn't good enough!? I've been wanting to blog my opinion of the weekend's royal shenanigans but I see Polly seems to have read my thoughts in every detail and written them down already. So I'll save my time and simply point you in that direction. I presume that unless she shuffles off her mortal coil any time soon, we'll have to put up with this every five or ten years from now on - God help us if she lives as long as her mother.